8 ft. 11-inch, 22-inch x 47-inch Insulated Steel Attic Ladder with 350 lb. 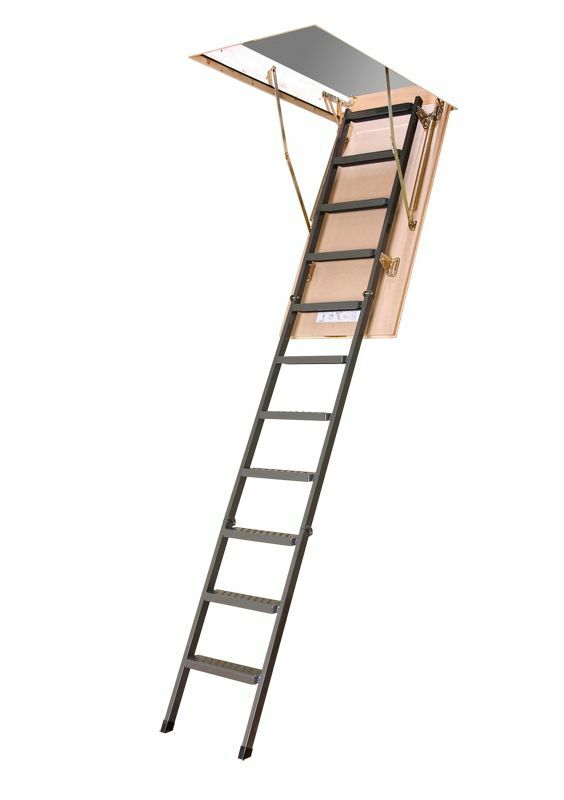 Capacity Type IA Rating An elegant attic ladder with high-quality design and materials, the Fakro Insulated Steel Attic Ladder features powder-painted metal and 3-part construction with a locking mechanism for ease of use. Anti-slip steps and rails with rubber ends offer safety, making this 350 lb. duty-rated, ANSI-approved ladder a smart choice. Built to accommodate a variety of home designs, the ladder is adjustable in length, door distance and spring tension to suit the needs of your space. 8 ft. 11-inch, 22-inch x 47-inch Insulated Steel Attic Ladder with 350 lb. Capacity Type IA Rating is rated 4.5 out of 5 by 6. Rated 5 out of 5 by Clivealive from Great door Very happy with the attic door, framing took some time. Needed help putting it in but very happy. Speedy delievery as well. Rated 5 out of 5 by Gleshe from Awesome Installed this a month ago and it awesome!! Very easy to open and close. Rated 4 out of 5 by Pat Dev from Easy as pie I would recommend this product to others. Installation was simple with very clear instructions. Seems very sturdy. Rated 5 out of 5 by JosephYUL from Well Engineered; Sturdy; Easy Access Product is shipped compact, fully assembled and ready as is. Well-engineered, sturdy & solid, unfolds down and folds back, up into the ceiling, easily. Well illustrated instructions provided and on-line videos available. Convenient for sure; in fact is a delight to use, really makes the attic accessible and useful. The Big Picture: a box/frame is built into the attic and the stair assembly is fitted squarely into this box. Skill Required: Carpenter, contractor or a very experienced handyman level of skill needed. (emphasis on 'very') This is because the frame must be cut square, into the attic according to specs; the attic invariably has electric cable, telephone and electronic wires, floor and joist beams. So carpentry skill is required. The Big Challenge: one strong person, (ideally two) must be able to lift the stair assembly into the attic and while up there, nestle the stair assembly into the prepared box/frame in the attic. (The instructions state this fact too, that a strong person is required.) A third person (me in this case) is needed down below, in the room where the attic door is located, to help guide the assembly as it is lifted up into the attic. The one or two strong persons in the attic then guide the nesting of the assembly squarely into the frame prepared. I selected the LMS 22" X 47" steel ladder as this fits well into a normal room, with eight foot ceilings. I used the existing attic door and enlarged it to fit the stair assembly. Yes, would recommend this product.